1) Four ladies A,B,C,D and four gentlemen E,F,G,H are sitting in a circle round a table facing each other in such a way that (i) No two ladies or two gentlemen are sitting side by side (ii) C, who is sitting between G and E, is facing D (iii) F is between D and A and is facing G (iv) H is to the right of B. Based on the given information Who is sitting to the left of A ? 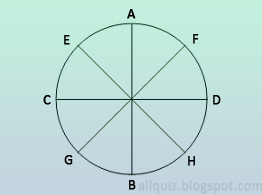 2) Based on the question 1, E is facing whom ? 3) Based on question 1 , who are immediate neighbors of B ? 4) A group of seven singers facing the audience, are standing in a line on the stage as (i) D is to the right of C (ii) F is standing besides G (iii) B is to the left of F (iv) E is to the left of A (v) C and B have one person between them (vi) A and D have one person between them. Based on the given information who is on the extreme right ? 5) Based on ques 4, If we start counting from the left, on which number is C ? 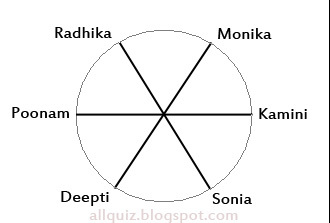 6) Six girls are sitting in a circle. Sonia is sitting opposite to Radhika. Poonam is sitting right of Radhika but left of Deepti. Monika is sitting left of Radhika. Kamini is sitting right of Sonia and left of Monika. Now Deepti and Kamini , Monika and Radhika mutually exchange their positions. Based on this information Who will be opposite to Sonia? 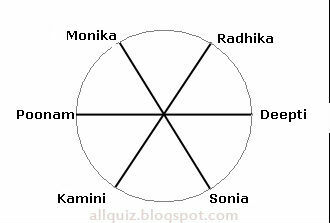 7) Based on question 6, Who will be sitting left to kamini ? 8) Based on question 6, Who will be sitting left to Depti ? Please post more question and that of difficult level.